Put another webdrama in the “so close” pile. High End Crush had so much potential, like Noble, My Love, but it just didn’t quite reach “great”. I don’t know who it was – the writer? the director? – but someone decided to take a decent plot and an award winning actor and actress and, dare I say, dumb it down. There’s just too much “silly” going on. Darn! I would have loved to see it all played out as a serious 10 episode drama. It would have been great. Yoo Yi-Ryung comes to the aid of a young woman screaming that some men are attempting to kidnap her. In trying to stop the bad guys, Yi-Ryung whacks one of them in the head with a board only to find out it was all a mistake. The girl was just trying to get out of a photo shoot she had scheduled. Because Yi-Ryung helped the girl get away she is coerced into filling in for the woman. While she’s all dressed up and the cameras are clicking, Choi Se-Hoon, the rich, arrogant, bossy CEO of the Choi Entertainment Company sees her and decides she has the right stuff to make it big in the entertainment industry. Things get complicated, however, when he happens to fall for the “Organic Girl” while trying to convince her to sign on with his company. Choi Se-Hoon is the typical haughty, egotistical, powerful, successful, wealthy, good-looking young man we so often see featured in Kdramas. He’s an insensitive jerk who thinks the world revolves around him and he always gets his way! He is cute, though, when he begins to fall in love for the first time in his life. The tough guy really does have a heart. Yoo Yi-Ryung is a quiet gal who grew up in the mountains without the luxuries of our modern world. (There isn’t even a road to her house.) Hence the nickname “Organic Girl” given to her by CEO Choi. She lived with her grandfather but he passed away and she is now all on her own. She doesn’t seem to mind all the entertainment fun for the short time she’s a part of it but, at the same time, adamantly refuses to make it a career. Jung Il-Woo began his acting career with a small part in the film The World of Silence, but soared to fame when he joined the cast of the family sitcom Unstoppable High Kick. He was great in Flower Boy Ramyum Shop, playing pretty much the same kind of character he does in this show. And he made me sob, uncontrollably, while watching him in the Kdrama 49 Days. Here’s a tiny little F.Y.I…. he and actor Lee Min-Ho have been friends since they were kids. I wasn’t thrilled with Jin Se-Yun’s performance as the North Korean girlfriend in the Kdrama Doctor Stranger. I thought her acting in that show lacked depth and conviction. Happily, I was pleased with her portrayal of soft-spoken Yoo Yi-Ryung. She was wonderful and definitely redeemed herself in this. High End Crush is too good to be as mediocre as it is. Here are some complaints I have… I know I’ve said this before but I’m not a fan of hand-held camera work and this show had a lot of it. Not good. It was also a little too fast paced, sometimes even noticeably chopping a scene short with large spaces of time unaccounted for. Also, not good. I didn’t care for the way the opening song/credits came at various times throughout the show. Halfway through an episode the show would stop, loosing its momentum, and the opening credits would begin to play. Really? Who’s idea was it to disrupt an episode like that? Again, not good. And there weren’t a lot of non-dialogue parts, either. The whole movie was talking. Very little of just watching something unfold. Every so often it’s nice to have the characters communicate silently but precious little of that happens in this drama. Not good, yet again. There’s a huge editing mistake in their nighttime outside kissing scene. 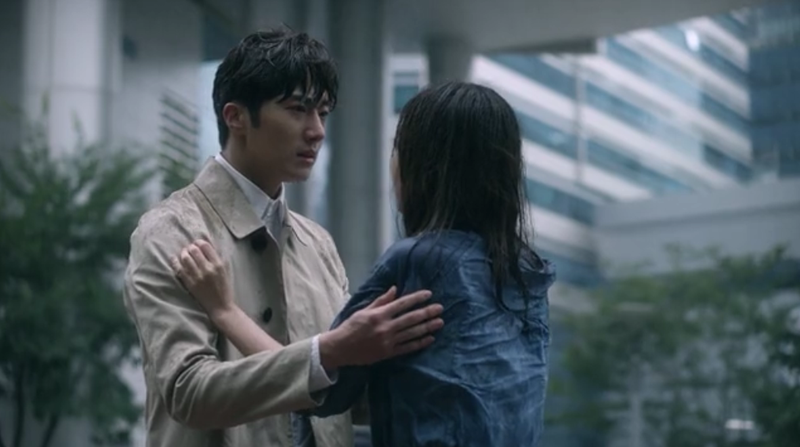 Watch carefully and you’ll see when Se-Hoon goes up to Yi-Ryung to kiss her she’s wearing his jacket around her shoulders, yet when he backs away there’s no jacket to be found anywhere. It didn’t fall off her shoulders during the kiss. It’s just nonexistent. I backed it up to see it again just to make sure I wasn’t wrong and, yep… editing mistake. Not good at all. And as I mentioned before, it was just too silly – drawing steam coming out of the nose of an angry guy, or people’s heads ballooning, for instance. Almost always, things like that are just annoyingly distracting to me. What are we up to?… Not good #6? Now the good… one big plus was putting the lovers from the Kdrama Falling in Love With Soon-Jung together in this. Jung Kyung-Ho and Kim So-Yeon pair up once again as co-anchor people of a kind of tabloid news program. I smiled each time they showed up. Fun, fun, fun! Is that a clever idea or what? And another yippee is Jung Il-Woo’s real kissing. He doesn’t just place his lips on hers. Yahoo for kisses with mouths that open. High End Crush is a Chinese-Korean production which may explain why Yi-Ryung would mumble some Chinese sayings to herself once in awhile. (I wonder if they are real Chinese proverbs.) The boy group on the show even puts some of them in a rap song. Thankfully, whenever she speaks in Chinese it is translated so we can understand what she’s saying. The soundtrack is pretty good. Since the backdrop of the show is an entertainment company we get to hear a boy group practicing some songs, which aren’t bad at all. I wish I was up on all the Kpop groups so I could tell you whether or not the guys on this show are a real group or not. Sorry. All I can say is, they were good. Unfortunately, the opening song and another one that is played a lot are so not good, they’re irritating. You’ve got to hear them to understand what I mean. The scenery is wonderful. The mountain shots when Se-Hoon is at Yi-Ryung’s house are absolutely beautiful. And I liked the Choi Entertainment Company building. Do I recommend you spend time on High End Crush? Yes. It’s not wonderful but the fact that it has the potential to be wonderful makes it worth watching. The last line in the show mentions a season two. I hope that wasn’t just put in there to be funny. Who knows… maybe a sequel could be the kind of show this webdrama deserves to be.